The calendar below IS official...third time is the charm! 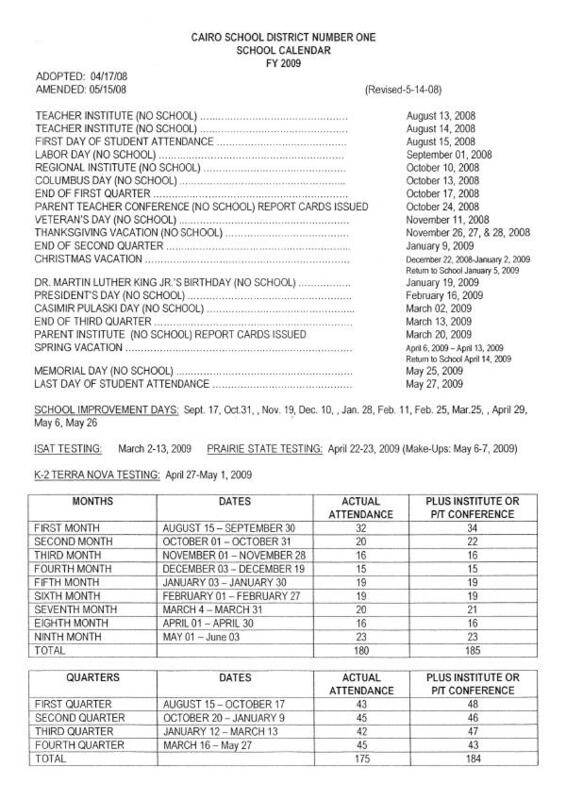 The following NEW revisions to the posted calendar below were approved by the Cairo Board of Education on September 18, 2008. HOPEFULLY, the FOURTH time is the charm! Be careful planning for next summer's "get away"! If you look at the "last day of student attendance", it is listed as May 27, 2009. In a break with past practice, the "5 emergency days" are NOT built into that date. As you know, in the past, any emergency days NOT used were SUBTRACTED from the listed date. Next year, any emergency days USED will be ADDED to that date!!! So, if you are "old school", plan on the "last day of student attendance" being June 3, 2009. Maybe a quote from Alfred Lord Tennyson's The Charge of the Light Brigade would be appropriate..."Theirs is not to reason why, theirs is but to do or die." In yet another change to the calendar - not discussed or voted on in open session at any CSD #1 BOE meeting - Spring Break has been changed! Spring Break will begin on April 10th (Good Friday) and run through the following week. School will resume at the regularly scheduled times on Monday, April 20th. Fortunately, we are running out of time to make any further changes to this year's calendar, except, of course, the usual necessary adjustment of the final day of student attendance due to the use of emergency days. Five emergency days were built into the original (and successive) calendars. As of March 10th, seven have been used. Assuming that the District puts in for two "Act of God" days, the final day of student attendance for the 2008-09 school year should be June 3rd.